Matt & Nat have cleverly brought a little edge to the usually bohemian style with small studs and metal rings around the edge of the flap. The rings remind me a little of the ones that bind notebooks, but that's not entirely a bad thing! That studious accent makes this hobo seem a bit more quirky. The double flap looks modern, but it's also quite clever. You can pick up one flap to access the rear compartment, or both to get into the main section. This design is perfect for separating valuables or easily scratched sunglasses from the rest of your cargo. All too often synthetic materials look cheap, but Matt & Nat has really perfected vegan leather. That name seems like a bit of an oxymoron, but Matt & Nat's material looks closer to leather than most man made alternatives. It's got an authentic weathered look and just enough shine to impress. But one of the Holly's best green secrets is hidden inside. The mid-sized interior is lined with a unique sustainable material. It feels like suede, but it's actually made from 16 recycled plastic bottles! The space is practical too, with a couple more pockets than Matt & Nat typically offers. That's not bad in a bag that is also a bit smaller, and more manageable, than much of its range! It's not real leather, but its vegan alternative is of high enough quality to justify the Holly's $240 price tag. 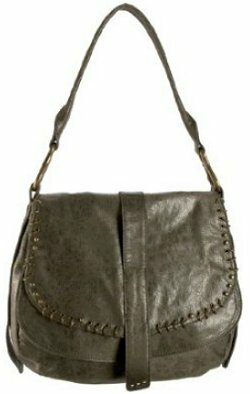 The Matt & Nat Etta hobo bag, a great alternative to this hobo bag.